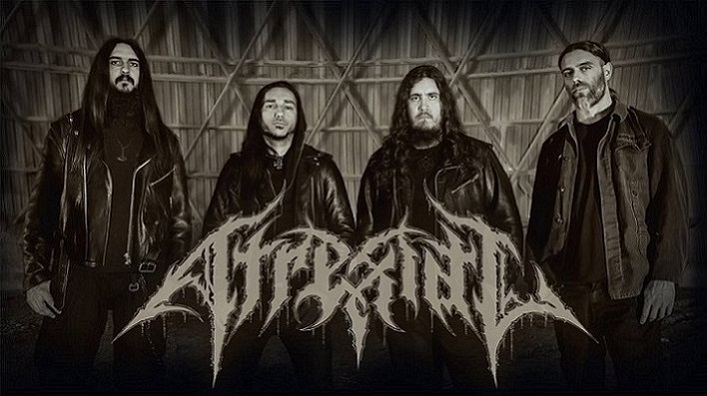 Atrexial is a band formed by experienced musicians in the Spanish and Catalonian Black and Death metal scene. Atrexial was born as a solo Project by Naga S. Maelström, but over time he found great musicians interested on being part of the Project such as Louen (Nyctophobia) on vocals and Labelua (ex - Abrahel) on drums. Once gathered, the songs were recorded, mixed and mastered, so the next step was to make it official and elevate the project to a new level, so Atrexial is now a band ready for taking over the stages. The first words that come to our minds are “organic, elegant and atmospheric”. We’ve tried to shape the darkest desires of the human condition exploring them with subtlety and from a more primitive perspective. The goal was to merge Death Metal’s belligerence and darkness rawness and also adding razorblade melodies. The combination of all these agents enables an analytic exploration allowing the listener to embrace a deeper message instead of the typical uncontrolled fury that this genre proposes. The lyrics are focused on inquiring into the most primitive and philosophical meaning of three of the greatest concepts or phases of the human mind. We did not just want to remain on the surface or the material world but our aim was to reach the intangible phase where instinct is born. These concepts are sorted by antiquity: fear and submission, ambition and desire for power, solitude and existence. These are the notions Souverain explores. 4.What is the meaning and inspiration behind the name 'Atrexial'? Atrexial is just a name for an entity intended to be a spiritual tool for those who prefer to deepen into the void between existence and transcendence. Atrexial has no other meaning than that, and that’s how it works since mankind needs words to identify ideas and create abstract concepts. We have not played live so far. The line-up has recently been completed. IF everything keeps working like it should, then we will play live from September on. We are preparing all details regarding the live shows and we can only anticipate that the experience will generate a surrounding and menacing atmosphere. We don’t play music to be relying on an extremely visual concept because visuals must be a complement and not a smokescreen. We don’t operate with occult, bloody, or bizarre stuff. We just want the smartness of Souverain to be appreciated. We have received some very interesting offers from both national and international agencies. Our aim is to focus on our country first before crossing borders. We are about to announce a Spanish tour, some national and international festivals, and some huge gigs with legendary bands. All details will be announced on our social networks. This extreme metal underground world is on constant motion. Day after day new bands emerge and there is a huge offer and so little time to dedicate to listening to so many bands. Some of them are extremely good. If we assimilate that, we must say we are pretty satisfied with how well the album is being sold on digital download, and on how many pre-orders we have received for the physical edition of the album. All specialized media that has dedicated a review to Souverain has rated it on very high results. Maybe “competition” is not the proper word, but “survival” is more suitable and we got the attention of many people and that means we are doing a great job. Louen has been vocalist and guitarist for Nyctophobia, a black metal band from Barcelona since 2005 which is on standby mode. He is also working on many other projects soon to be announced, and a solo project of Doom. Labelua is part of another band; a Death Metal project called Apostles of Perversion, from the Canary Islands, Spain. And Naga S. Maelström is also part of Human Carnage, a Tech-Death metal band from Barcelona, and also Cauldron, a well known Black Metal band in Spain with more than 20 years of existence. We expect to band to keep growing. We will spread our music everywhere we will choose to go. It is not easy to be part of the underground world of extreme music but we have a powerful tool and a message to spread. Atrexial is not a self-limited band. We are part of a vast musical field, and that grants us freedom to go wherever we want to while songwriting. Our message is better understood if we assimilate the concept of Black metal and Death Metal, specially Polish Blackened Death metal, and bands like Mgla, Behemoth, Vader, Behexen, Sargeist, Dark Funeral have been part of our past and present. It is undeniable that we have these kind of roots, but we have also added some personal nuances. Human being has always inherited fear and curiosity, and tried to search for an explanation to all things including dark matters. Consciousness is the basis of the being and gives a meaning to everything around. We see occultism as a philosophical current that tries to decipher and bring the unknown to words. Occultism has already been seen as a counterpoint to all religions with the difference that it is considered a science and a gateway to the spiritual side of the individual. We stick to the most individual point of view. There’s something that cannot be stolen, manipulated or destroyed and it is self consciousness. Without that, there is not being and without being there is no collective. So, all symbols and manifestations are a product of the individual. Irrelevant. Atrexial is an entity that spreads a message through music frequencies and all information outside this context and margins, is not important.